Writing the only restaurant blog in Reading can feel like a lonely pursuit at times, but if you really want a lonely pursuit it’s this: writing a review where you say that the Corn Stores is a distinctly mediocre restaurant. The only reviews of the Corn Stores I could find online were comped, so they were all breathlessly enthusiastic and gushing. But, that aside, I know quite a few people who have been to the Corn Stores, and they’ve all raved about it. Some of them, and I know they read this blog, have been back more than once since it opened in December. So I was really hoping not to be the lone voice, the sore thumb, but I went there this week and I really didn’t get it at all. All the blogs and Instagrammers will tell you what an amazing job the Rarebreed Dining Group did of refitting the Corn Stores when they took over the derelict building and turned it into a bar, restaurant and private members’ club. They used local company Quadrant Design, and I agree that they’ve breathed life beautifully into a lovely but unloved space (one I largely remember from lunch breaks with my brother in 1996, when we used to sneak across from our McJobs in Apex Plaza opposite for a rushed pint or two). He wouldn’t recognise it now: the restaurant, on the first floor, is superbly done out, with bare brick walls, leather-banquetted booths and tables with dusky-pink, scallop-backed chairs. I was there with my other half Zoë rather than my brother (mainly because I have also gone up in the world somewhat since 1996). 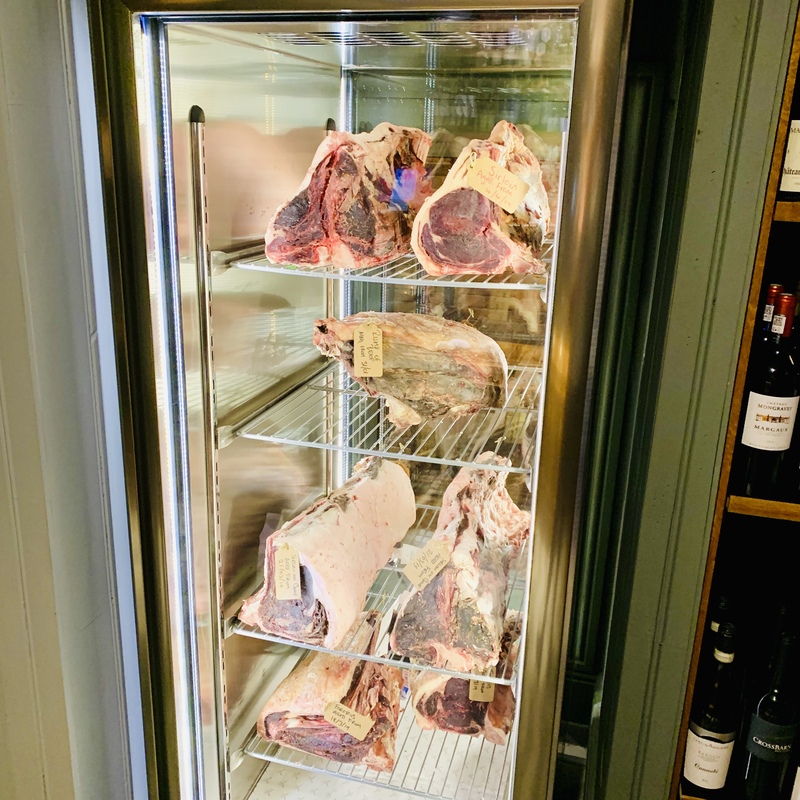 As we were shown to our table – past the display cabinet full of aged beef – our waitress explained the concept, that they butcher and age their own meat. There was a certain pride about it which I respected, and it made me look forward to dinner: I knew from researching the menu beforehand that the Corn Stores was an expensive restaurant, but I was hoping for a showstopper, the special occasion restaurant Reading has been missing for many years. Our table was one of the booths, and I was impressed by how spacious it felt for two people: CAU, back in the day, would have tried to seat four people at a booth that size (the other tables for two felt a little more poky: I’m not sure how much I’d have liked one of those). The restaurant was nicely buzzing and pretty full on a weekday night, and it exuded that glow of satisfaction you get when surrounded by people who are happy they’ve made a right – and exclusive – choice (the Nirvana Spa effect, you might say). “My mum would like it here” said Zoë, adding the Corn Stores to her mental list of places to take her mum to. We ordered a couple of pints of Meantime lager while we decided what to order: it’s kept in tanks onsite so you get it fresh, unfiltered and unpasteurised. I thought it was cold, crisp and clean and I loved it – Zoe less so, because she detected a bitter finish. I’ve already said that the Corn Stores is an expensive restaurant, and I fear this is a point we may return to often throughout the rest of this review: starters are just shy of a tenner and some of the mains are just the right side of twenty pounds, although if you order a steak you’re highly likely to pay far more than that. Oh, and there was a “whole baked sourdough” for six pounds fifty, which has to be the most expensive bread I’ve ever seen on any menu anywhere (you get “your choice of butter”: really, for six pounds fifty you should get to try them all, I reckon). There was also a specials menu with other options including a Barnsley chop, a pork tomahawk, smoked sirloin on the bone – and a chateaubriand with lobster and some other gubbins which cost the grand total of ninety-five pounds (I know people who have ordered this, and they raved about it, but really: you could eat Michelin-starred food for that money). None of that especially appealed, but also I wanted to judge the place on their standard fare – the meat and potatoes, you could say – so we stuck to the normal menu. At the table next to us, three well-to-do ladies chatted away as their main courses, completely untouched, went cold in front of them: Zoë and I exchanged looks. We started with the “Rarebreed Board”, a sharing selection of interesting options. It was the most expensive starter on the menu (twenty six pounds, in fact) but I figured it gave us an opportunity to try out lots of different things. 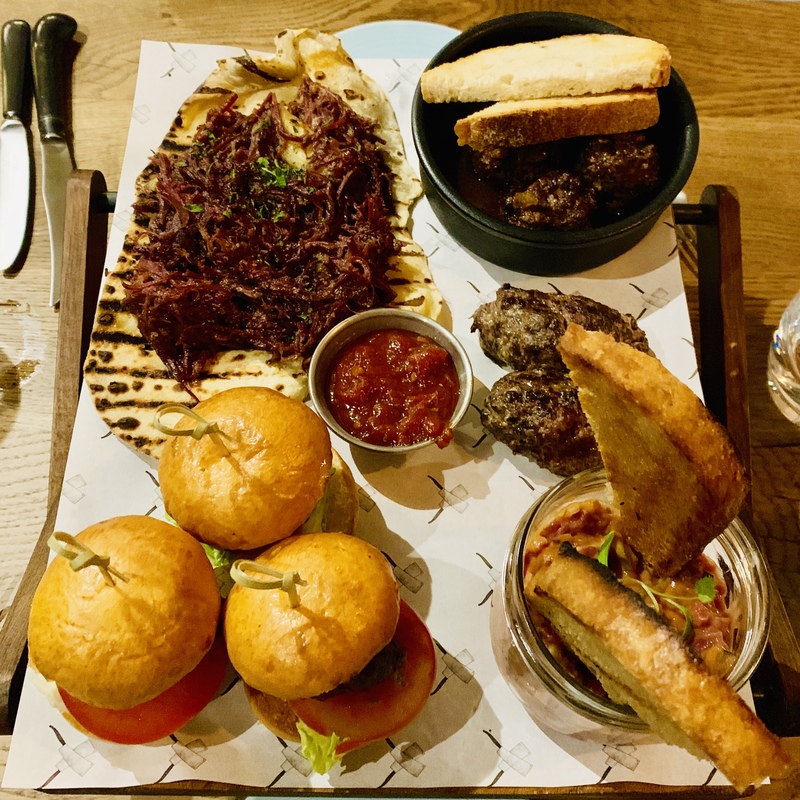 It came on a sort of folding trestle table which left us limited room for our side-plates, but you couldn’t deny it looked appealing: five different beef dishes, designed to be shared between two. Much of the sharing board was sort of a symphony of mince, so you got steak meatballs, miniature burgers and “beef and pepper sausage” – which was more like sausagemeat, on account of there being no casing. They were all quite nice, but much of a muchness – the main variations being in coarseness, but the overall texture was very similar. We both liked the sausage best, with there not being a huge amount to choose between the burgers and the meatballs. Even at this stage though, the execution was lacking. The burgers came with lettuce and tomato in naked brioche, no cheese, no sauce (the pepper or tomato sauce in a little metal dish made a useful dip). The meatballs were apparently served with red wine gravy, but the thin lake of liquid at the bottom of the dish was largely ineffectual. Perhaps you were meant to dip the accompanying toast in it, but it was pretty hard when it arrived and, by the time we got round to it, it was even worse. There were three burgers and three meatballs, which was odd and just made sharing trickier – I’d rather those two dishes had been better and smaller, and the price had been nudged down a little. I liked the other two dishes on the board better – the steak tartare (served, somewhat randomly, in a jar) had some real tang and pungency from the Worcester sauce, but Zoë found it too vinegary and couldn’t finish it. Similarly, the salt beef on flatbread worked beautifully for me, but amid the mustard there was also a vinegary tang that put Zoë right off it. Even in this dish there was the oddity of little segments of potato – double carbs, and extra bulk, but totally unnecessary. By the time we finished our starters the table next to us had eaten half of their main courses, if that. One lady had cut her cod burger very precisely in two and looked like she was considering, possibly before the evening was out, embarking on eating the second half (it never occurs to me that some people go to restaurants for the company, or to see and be seen, but that might be just me). I got a second pint of Meantime and Zoë tried the Curiouser & Curiouser, a beer by Kentish wine producers Chapel Down – it tasted of grapefruit and citrus and I really liked it, although Zoë seemed less convinced. We’d decided to tackle different ends of the menu, so we went for one of the pricier and one of the more affordable main courses. Zoë’s burger – wagyu beef, with Ogleshield cheddar and bacon – looked lovely, and the bite I had wasn’t half bad. But it cost nineteen pounds, and it didn’t feel, to me, like a nineteen pound burger (I’m not sure what a nineteen pound burger tastes like, but not this). “It’s really nice” said Zoë. I agreed with that – even when unadorned, Honest burgers have a lovely crust to them from the grill, and there’s a bit of salt in there. This was almost as good, but it cost nearly twice as much as its equivalent over on King Street. I had gone for a two hundred gram fillet steak, served rare, with béarnaise sauce. The Corn Stores website boasts about how they baste their meat with aged beef fat and cook it on a Robata grill, getting loads of flavour into even lean cuts like fillet. This was, it’s safe to say, not my experience: they’d managed the impressive combination of serving a steak where there was almost no char at all while simultaneously overcooking it. It was meant to be rare, but it was probably medium at best: just about pink in the middle, but with no juices oozing out as you made your way through it. I couldn’t face sending it back, because I really wanted to eat dinner at the same time as Zoë and I knew that sending it back guaranteed that wouldn’t happen. Besides, by then the damage was done – if you’re a steak restaurant, and one charging that kind of money, cooking the steak right first time was the entry level requirement. That wasn’t all, though, because really the steak didn’t taste of very much. I didn’t get any seasoning, I certainly didn’t feel like it had been anointed with glorious, salty beef fat, nothing of the kind. The béarnaise didn’t help matters, being a little on the thin side, heavy on the vinegar (bit of a theme emerging there) and light on the tarragon. It was also a pretty mingy helping of béarnaise, because the Corn Stores seems to have missed the memo that béarnaise sauce should be as much for your chips as your steak. The salad it came with was pleasant enough, but it rankled with me that you got a big pile of salad for free but had to pay for your chips – by contrast, chips came free with the burger. This brings us on to the chips – beef fat chips, no less. I had high hopes for these, but they were also deeply ordinary. They didn’t have the crunch-fluff ratio of a perfect chip, they were exceptionally salty and some of mine had grey patches which should have failed the most elementary quality checking. Dipped in the béarnaise they were okay, but no more, and they weren’t much better with the mayonnaise we’d asked for (which came in two minuscule pots which looked as if they had housed lip balm in a previous life). I looked round and everybody seemed to be having such a lovely time. What was I missing? We’d asked our waitress for recommendations for a side dish and she had recommended the baked flat mushrooms, so we went for those. Four pounds got you three rather small flat mushrooms which had a meaty texture but again, didn’t feel like they’d been exposed to much in the way of butter. If I’d had them in a Beefeater I’d probably have been pleased, but here in the Corn Stores it just felt like another way of extracting funds. There was the ghost of a sprig of thyme on top, as if to say Look, we did do something with them. By this point we were on to our third drink – a serviceable glass of Pinot Noir for me and Chapel Down’s cider (which I really liked) for Zoë, and positively planning our escape. The waitress took our dishes away and half-heartedly asked if it had been good, and we half-heartedly replied that it had been fine. The fact that both of us had half-heartedly half-left our chips didn’t seem to register. That was service in general at the Corn Stores – smiling, efficient, a little robotic. I didn’t get any real warmth or personality. 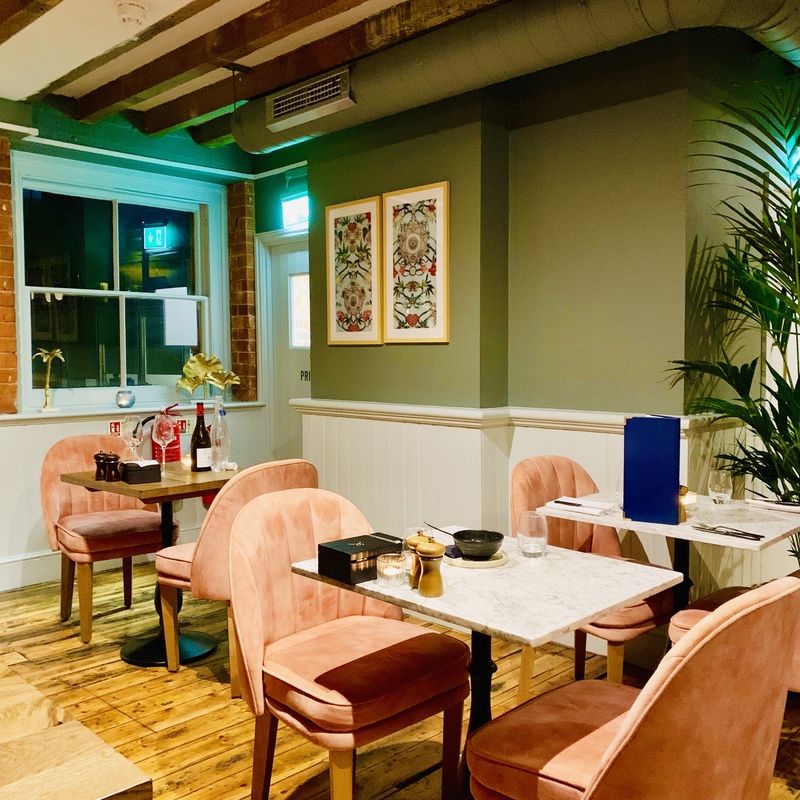 Dinner for two – a sharing starter, two mains, some chips, a side and three drinks apiece – came to one hundred and thirty pounds, including a not-that-optional 12.5% service charge. I’m almost tempted to leave that sentence to do the work on its own, but really: one hundred and thirty pounds! 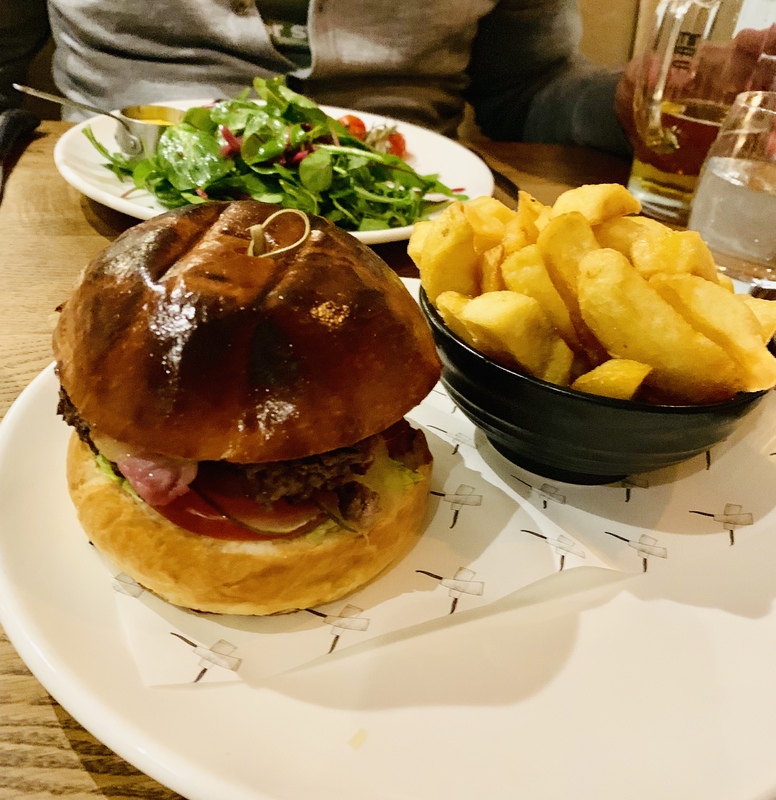 When I think of all the amazing meals you could buy in Reading for a fraction of that price – or all the exquisite meals you could buy in London for that money – I felt like I’d cheated rather than treated myself. “I don’t think I would take my mum here, you know” said Zoë, unsurprisingly. That might sum it up, for me. I couldn’t shake the feeling, throughout my meal, that I was paying for the refurbishment, or helping Rarebreed pay off their investor (the interestingly-named Havisham Group), but I didn’t feel like I was paying for a truly luxurious experience in a terrific special occasion Reading restaurant. The talk about the Corn Stores’ pride in their meat and butchery is all well and good, but the main thing my meal did was make me miss CAU. I think, actually, I had no better or worse a meal at Miller & Carter, where I paid a lot less money. 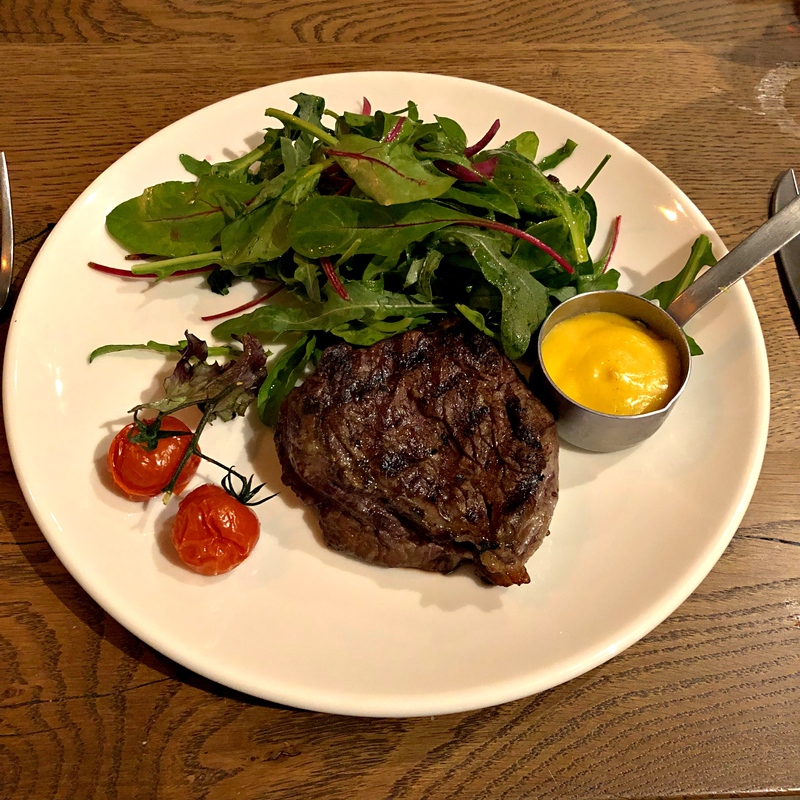 Worst of all, I went to the Southcote (a Beefeater) last year and although it wasn’t as good as the Corn Stores it was a lot closer than the huge disparity in price would have you believe (and their béarnaise, damningly, was probably slightly better). Anyway, it doesn’t matter what I say: I have no doubt that the Corn Stores will do really well, but I felt like if it had been half as good as it thinks it is it would be twice as good as it actually is. But what do I know? I read some lifestyle bloggers recently, and they tell me the emperor looks fantastic in that outfit.